These "Back To School" themed 3 step drawing pages teach students how to draw fun school themed pictures in three easy steps. 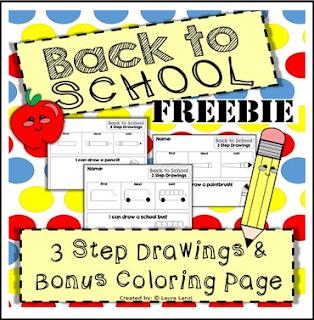 Take each of the 3 sheets and use them as a teacher lead directed drawing for the whole class, or if your looking to fill some quiet time, hand the individual sheets out and have the students use the visuals to try and draw them on their own! The three drawings included are: Paintbrush, Pencil, and School Bus. Plus there is a bonus coloring page! Looking for a fun craft for the new school year? And check out this fun Halloween Activity! Follow my TPT Store by clicking on the green star next to my profile picture at the top of my store page! Want sneak peeks of upcoming projects and access to flash freebies?